This excellent recipe hails from Cooks Illustrated. I've made it two or three times and it always comes out perfectly - just the right mix of crispy and browned on the outside and tender on the inside, thanks to their extensive testing. 1. Adjust oven rack to lowest position; heat oven to 475 degrees Fahrenheit. 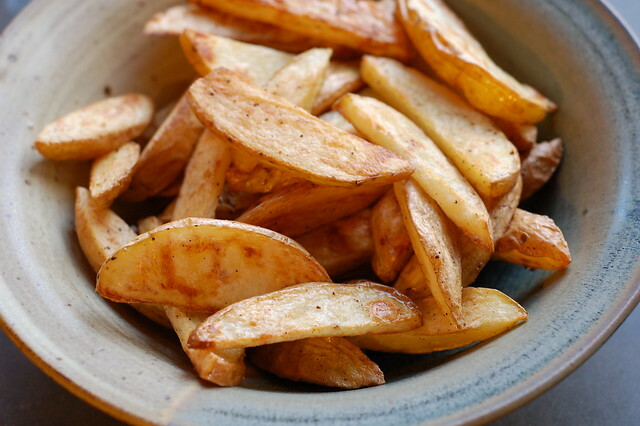 Place potatoes in a large bowl and cover with hot tap water; soak 10 minutes. Meanwhile, coat 18 by 12 inch heavy duty rimmed baking sheet (thinner sheets won't work as well) with 4 tablespoons oil and sprinkle evenly with about 3/4 teaspoon salt and 1/4 teaspoon pepper (this acts as ball bearings to help prevent potatoes from sticking so much). Set aside. 2. Drain potatoes. Spread potatoes out on a triple layer of paper towels and thoroughly pat dry with additional paper towels. Rinse and wipe out now empty bowl; return potatoes to bowl and toss with remaining 1 tablespoon oil. Arrange potatoes in a single layer on prepared baking sheet; cover tightly with foil and bake 5 minutes. Remove foil and continue to bake until bottoms of potatoes are spotty golden brown, 15 to 20 minutes, rotating baking sheet after 10 minutes. Using metal spatula and tongs, scrape to loosen potatoes from pan, then flip each wedge, keeping potatoes in a single layer. Continue baking until fries are golden and crisp, 5 to 15 minutes longer, rotating pan as needed if fries are browning unevenly. 3. Transfer fries to a second baking sheet lined with paper towels to drain. Season with additional salt and pepper to taste and serve.